The Legends found themselves feeling the disco fever thanks to their latest episode, and decided to channel it directly into a fantastic music video. The crew of the Waverider is wearing some disco era outfits for the upcoming episode Here I Go Again, and while they were on set they decided to make a music video to go along with it. Caity Lotz (Sara Lance), Brandon Routh (Ray Palmer), Maisie Richardson-Sellers (Amaya Jiwe), and Nick Zano (Nate Heywood) all got down to the sounds of Stayin' Alive by the Bee Gees, and it's as entertaining as you would expect. "When your feeling the disco vibes and decide to shoot a music video on set #Legendsoftomorrow"
The disco outfits are just one part of the promising episode, which has the Legends stuck in a time loop, with the only one not affected being Amaya. It's up to her and Gideon (reprised by Amy Pemberton) to help the other Legends avoid a devastating explosion on the Waverider, and the episode as a whole is essentially a DC take on Groundhog Day. The actual inspiration is an episode of Star Trek: The Last Generation (Cause and Effect), but either way it promises to be quite the entertaining episode. You can find the official synopsis for Here I Go Again below. 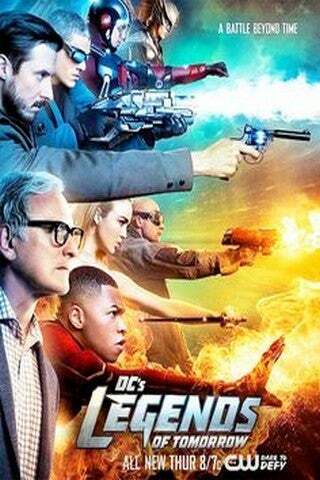 "After the team returns from a mission, Zari (Tala Ashe) finds herself trapped in a time loop that results in the Waverider blowing up over and over again. Zari soon begins to suspect that the answer to stop what is happening might lie hidden among her fellow shipmates’ secrets. But in investigating them she starts to understand her place on the team. Ben Bray directed the episode written by Ray Utarnachitt & Morgan Faust." DC's Legends of Tomorrow airs on Monday nights at 8 p.m. ET/PT on The CW. "Here I Go Again" will debut on February 19.